Not Lu here: I’ve always wanted to write an epic fantasy book, but couldn’t come up with any good ideas. The god of inspiration just doesn’t shine on me the way he does for Justan (Yes, all of Justan’s good ideas come from the god of inspiration. All of his bad ideas come from thinking for himself. He should really start listening to the god of inspiration a lot more.). Oh, sorry, now back to me. Even though I don’t know how to come up with ideas for myself, I do know how to scheme… especially if it means a scheme that pisses Justan off. So, I’ve come up with a handy and nefarious guide to stealing Justan’s ideas. The best part about the scheme is that I took most of the words from reviews of Death’s Merchant. 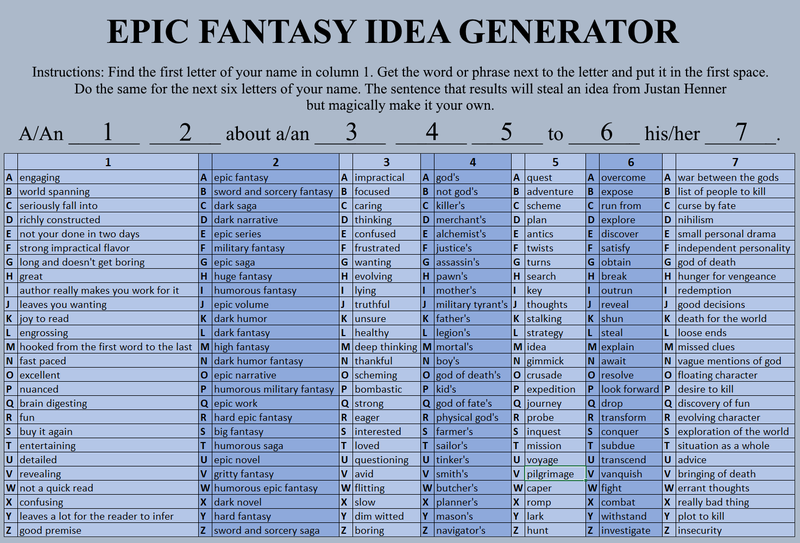 That way you know that the idea you get from my epic fantasy idea generator will guarantee a highly rated (but confusing, frustrating, brain digesting, errant thought — or my own personal favorite — author really makes you work for it) book! The even bester part of my scheme is that my idea generator tailors the idea specifically to you so lots and lots of you can steal ideas from Justan but they’ll all be different. That way Justan will never figure out that you stole it from him. To get your specifically tailored and totally your own epic fantasy idea that is just for you, all you have to do is put the words (you get from my handy chart) that correspond to the letters of your name (which you got from your parents) in the specially prepared slots that I’ve provided in a sentence just for you (in my handy chart). And as Lu told Null, for the love of the gods, do it in the order provided so we can move this process along!